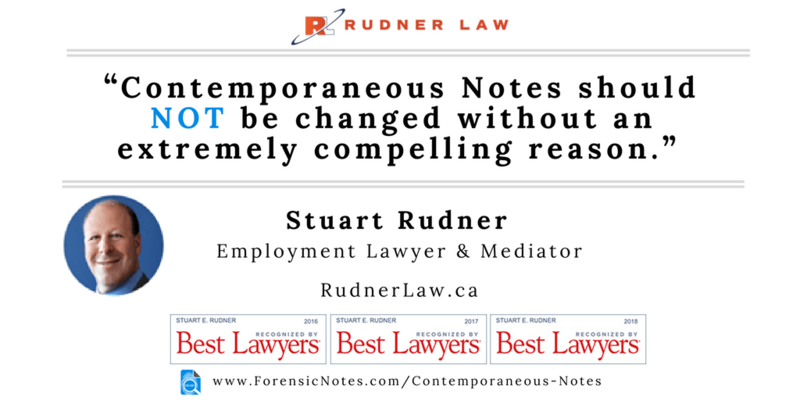 Recently I had the amazing opportunity to ask Employment Lawyer and Mediator Stuart Rudner some questions regarding contemporaneous notes. As you will read, it is not just law enforcement that need to be diligent in taking contemporaneous notes, but any type of investigator, including those investigating the workplace. The principles behind notetaking really do cross all disciplines, and I am excited to share Stuart’s responses to some big questions around this important (and often overlooked) task. Stuart answers why notes need to be contemporaneous and why integrity of the notes is vital. Contemporaneous Notes are notes made at the time or shortly after an event occurs. They represent the best recollection of what you witnessed. Events which occur at the same time or very proximate to each other are said to be contemporaneous. Living or occurring during the same period of time — contemporary. …cases will be decided based upon the evidence, and not necessarily the truth. 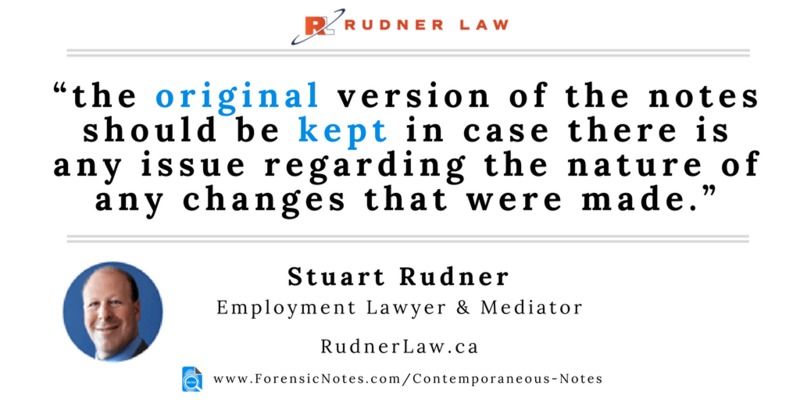 As you can read within the following responses, Stuart’s professional and legal opinion is that contemporaneous notes should not be changed except for potentially small corrections. As stated below, the original contemporaneous note should always be kept and provided as requested. 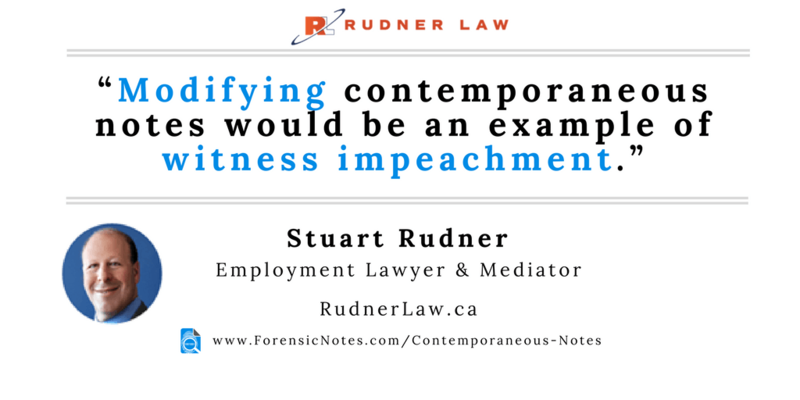 Failure to provide the original contemporaneous note could result in impeachment after an exhaustive cross-examination shows that you may have made changes to the original notes meaning to change the outcome of your investigation. If you fail to provide the original notes, you have made the opposing lawyer’s job easier in causing doubt within the courts regarding your testimony. 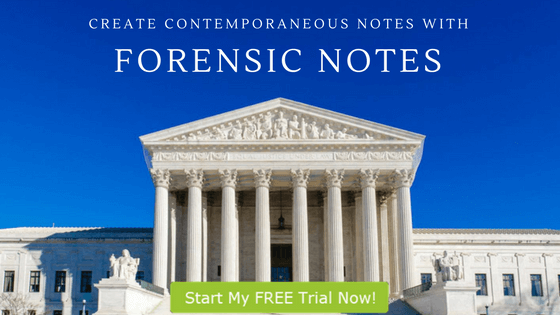 Click Here To Sign Up with Forensic Notes Now! If I’d know about these Forensic Notes two years ago my life might be very different right now. This is exactly what I needed and tried to create for myself through emails, but emails can be intercepted and are property of the employer. I have signed up for the free trial to give it a test run. Stuart Rudner and his firm, Rudner Law, specialize in Canadian Employment Law. Stuart has been listed in Best Lawyers in Canada (Employment Law) and named a Top Legal Social Media Influencer (follow him on Twitter @CanadianHRLaw). His firm was named one of the Top 3 Employment Law Firms in the country. Stuart is the author of a leading text on Summary Dismissal as well as chapters in four other books. He can be reached at stuart@rudnerlaw.caor 416.864.8500. How valuable are contemporaneous notes as evidence within courtrooms? In my practice, I spend a lot of time guiding or assessing investigations. 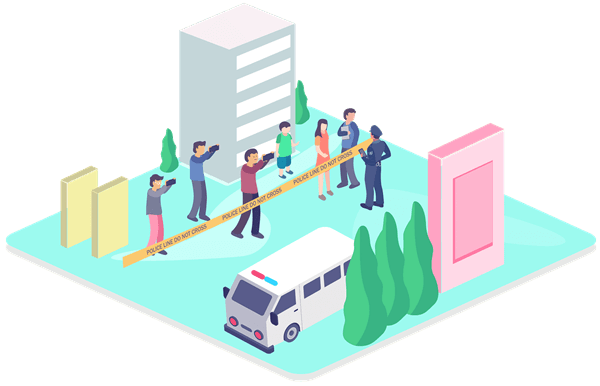 It is important to always bear in mind that when conducting an investigation, the investigator should consider how their work would be viewed if it had to be assessed by a Court or Tribunal. This applies to investigations of misconduct generally, harassment, or anything else. Ultimately, if a decision is challenged, a Court or Tribunal is not only considering the conclusion, but the process. In recent years, it has been confirmed repeatedly that employers have a duty of fairness in the course of an investigation. When an investigation is contemplated, employers must remember that the purpose is to determine what happened. It is an investigation, and not a prosecution. All of the evidence will be assessed; this includes documentary evidence, and evidence given by witnesses. With respect to the latter, it is critical that there be a clear record of what they said. When conducting an interview, an investigator must determine how to create a detailed and accurate record of the discussion. In some contexts, a record will be appropriate. That is not always possible or appropriate, however. If no recording will be used, then taking good notes is a must. And the most reliable notes are those taken contemporaneously. Otherwise, they will be subject to the frailties of the interviewer’s memory, which will only be exacerbated over time. Notes cannot always be used as evidence per se, but they can be used to support the evidence of the interviewer/investigator. And if they were taken contemporaneously, they will be more compelling than notes put together after the fact. Prior to an investigation taking place, employers should document all incidents of misconduct, as well as performance concerns, regarding their employees. When a corporate client contacts me to discuss potential dismissal, I always ask to see the employee’s file. It is amazing how often there is absolutely no evidence of the allegedly ongoing issues. Do you believe you are justified in firing an employee without providing a severance package due to ongoing issues? Read Stuarts informative article on Termination for Just Cause to ensure you are taking the proper steps. How soon should notes be written after an incident for them to be considered contemporaneous? “Contemporaneous” notes should be taken during the interview. Notes should be written throughout the discussion, with the note-taker writing down questions and answers as they are spoken. They can be typed if that is more efficient. In your legal opinion, can contemporaneous notes be edited after they are initially written? Contemporaneous Notes should not be changed without an extremely compelling reason. “Corrections” to fix spelling or grammatical issues, or to make the notes more legible, are acceptable but the original version of the notes should be kept in case there is any issue regarding the nature of any changes that were made. Other than fixing such issues, notes of an interview should not be changed. Doing so will raise serious concerns regarding the accuracy of the notes and the legitimacy of any conclusion reached by the investigator. How would you cross-examine a witness, if you suspected that he had modified his contemporaneous notes? Modifying contemporaneous notes would be an example of witness impeachment. The prior statement, which in this context would be the original notes, could be put to the witness, who would then have to explain the change. If the original notes do not exist, then the cross-examiner would have to assess the physical or digital notebook and look for any evidence of tampering. If you questioned the date & time of when a contemporaneous note was allegedly made, what proof of the date & time would you accept for electronic documents? That is a difficult question, as there are so many tools for taking notes, and many ways for “changing” the date and time of a document. Some applications will allow you to see a history of changes. In some cases, we could have a forensic analysis of the document performed, which could reveal changes and the timing thereof. The ability to change a documents date & time can be easily accomplished with various Anti-Forensic tools or techniques. This is discussed within our Fake-A-Date video. This is why Forensic Notes Digitally Signs and Timestamps each note creating a Forensic Note that can be easily validated. Any final thoughts regarding contemporaneous notes? Contemporaneous notes of an interview in the course of an investigation are a crucial piece of evidence, particularly when there is some dispute over what was said. 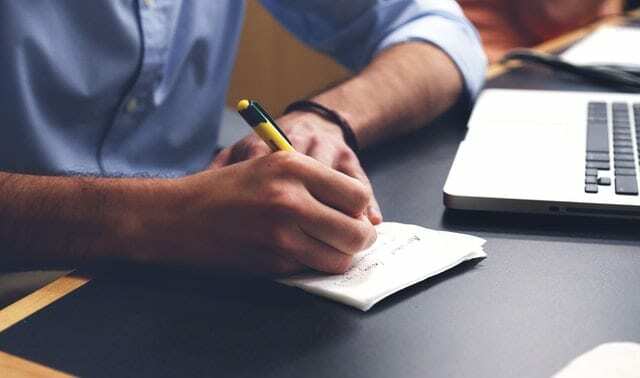 A good practice is to take notes during the interview and then have the witness review and sign them before they leave, confirming their accuracy. It will then be hard for the witness to change their story later. However, the interviewer should also not change their evidence after the original contemporaneous notes have been made. They can always be supplemented, but should not be changed in any way that would change their meaning. I only have the ... Starter Account, yet you took time to write me an email to help me. You are amazing! I only have the ... Starter Account, yet you took time to write me an email to help me. I will tell anyone interested in notes storage/timestamped to choose you! Thank you for your time!